For my 2nd year students who have started learning modals! In the videos suggested below you will find clear and detailed explanations of the meanings of English modals. They all have been created by Youtube user iswearenglish whose style and manner of explanation make difficult things much more comprehensible. I am sure you will be more confident using such modals as “can, could and be able to”; “must and have to”, as well as “may and might”. All the videos are great! It’s so unusual to hear the explanations of the meanings of English modals from such an interesting and funny speaker. Listening to these videos you not only learn the modals, but also you get a great deal of kick out of the speaker’s style and manner of speach! Thank you very much! I think these are the most exciting videos I have seen before! I liked them very much! I agree with Feride, the videos are totally interesting. The explanation is clear, the language is perfect. It’s a great opportunity to learn grammar in an easy way. And I agree with girls, because he is very interesting man! He explains grammar with his soul and tries to inform us in clear English! I listened to his explanations with pleasure! Thank you very much for such useful and productive material !!! I liked these videos with such a funny teacher) To my mind, he explains the material very clear and organized. And also I’d like to mention his pronunciation in these videos, which is perfect. So without doubt, these videos can help me to improve both my grammar and phonetics. Wow, that man has a really cool beard, and his English is so good. I like the videos. And they’re really simple. Of course, I still can make a lot of mistakes, but if I watch the video again and again I’ll remember every rule. These videos are great! They’re very useful, because there have a clear explanation and good examples on the use of each modal verb. But I still have to admit that it is sometimes rather confusing to choose which modal verb to use, especially when you have to express a certain degree of probability. The videos help me to refresh all we’ve studied about modals, thank you! I like all videos with this man!These videos help me to understand better when and which modal verbs we can use. It is not a difficult topic. I caught nothing new for myself, BUT this man and his perfect, awesome beard!! =) He is funny and intelligent. 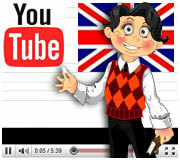 Such ‘self-made’ videos are very attractive and with the help of them it becomes easier to understand grammar! I really enjoy all the videos mostly because of the teacher’s perfect diction and his manner of explanation. Thank you for these links. Thanks a lot for the video. It’s really useful and helpful even though you know this kind of information. It’s important to watch such videos to recollect all the material you have learnt before. Besides, the man who explains the topic is really funny. I liked his beard) He explains everything clearly without any difficulties. The teacher explains the material very clearly so it’s a pleasure to watch these videos. Besides, the man has got very unusual appearance for the teacher. He is funny and intelligent at the same time! Thanks for the videos)) Okay I`d like to say that the first two videos were quite easy…. I mean your lessons were more constructive…Well, but Practice makes perfect! This theme was important to me cause I could not use modals in different situations…You see I didn’t know that «could» as a modal verb and « could » which is used in conditionals refers to the different situations and different meanings…The third video gives me some important information about «may » and «might». Well, the videos are interesting, but I understand the use of modal verbs poorly. All the information isn’t new for me. But I find the second video really useful. However, I like this videos not only for informativeness. I really like this man’s superb pronunciation. I like the videos.This man explains everything very clearly and also gives a lot of examples.I like his pronunciation very much.Now I really see the difference between may and might. To tell the truth Modal verbs is very difficult topic for me it’s completely difficult to understand when we have to use which of the modal verbs. these videos help me a little, but i think i should work more with this topic. could you recommend me some more material? I really like all the videos! This man always gives useful information in such an interesting way, and he makes me happy) I had a good opportunity to train myself. I really enjoyed watching the videos. I like his explanation. It is clear and it helps to lose some doubts. He also gives some good examples. Thanks a lot. These videos are incredibly funy. But also they are very useful. They help me to improve my knowledges about modal verbs. I have watched all the videos.I liked the pronunciation of the speakers very much. This man looks like Merlin from “King Arthur” movie! And though the material isn’t new, the video is helpful because he explains everything very clearly and consistently. These videos have helped me better understand the topic, and to be honest, I realized this topic in largely due to this video, because they explain the material very accessible. I had already knew a lot about modals, but anyway- thank you) All of the videos that you had posted here are great! Thank you one more time for not teaching us only with boring books and home tasks. Oh wow, this man is sooo nice! He looks like My tutor of the ukrainian when he explains me sth. I’d say I would be happy to have such teather at school. Thank you for these useful and interesting videos. The videos are really useful to practice and i understood everything what that man have said because he has spoken quietly and explains the meaning of (must) and (have to) clearly. All the videos were quite instructive and informative. After such simple explanations I have remembered much about modal verbs. Thank you very much! As for me I liked the explanation as well as the pronunciation, so we could learn phonetics through grammar. First video give me very useful information about using CAN COULD TO BE ABLE TO in different times. In the second video i liked very much phrase, which explain using MUST HAVE TO ” When you want to do and somebody else want from me to do’. Due to third video i repeat information about MAY MIGHT. It was interesting to listen to his pronunciation and explanation. It was interesting. Pronunciation is my sore point :), so for me it was very helpful. These videos are incredibly fumy. But also they are very useful. They help me to improve my knowledge of modal verbs. I have already seen three videos . I like these information and pronunciation were the best . How we must use CAN ,COULD ,TO BE ABLE TO in different times. In the second video I liked phrase must have to , and this man used many examples which helped me to understand this grammar expression . As for third video I repeat how I must use may/might in which cases. I agree with the previous comments that the information given in these videos is not too complicated and it’s very helpful though. I thought I knew it all about modals, but there are lots of tricky nuances. Also I’ve learn something new about modals. The first video was very good. I’ve never thought about strong requests with modal “can’t” such as, “Can’t I have a glass of water” it was new to me. It was nice to know, in what cases we use modals can/could/be able to. In the second video I also met the new information. I didn’t know before that “must/have to” have the different meaning in obligations. I didn’t know that “must” expresses my own desire and “have to” expresses what somebody wants for me to do. As for me, there isn’t any difference but as it found out there is a difference. In the third video there wasn’t anything new to me, but it was good to revise my knowledge. Oh, in this video I’ve learned that “might” can be also used for requests but for a very, very formal. I didn’t know about it before. Thank you for the videos! It was very helpful and useful! I ’ve just seen the videos and I’d like to say that I’ve found them very informative and useful for me. To tell you the truth, I had a little muddle about using of Modal Verbs, and these explanations have helped me to put a lot in its place. And thanks to the videos now I know some new meanings of Modal Verbs . These videos are not as interesting as the video about “Bad grammar”, but nevertheless it is a good way to organize our knowledge about modal verbs. The man offers us pretty memorable examples, and that’s good, because as for me it is easier to remember the rules at the hearing. In general, I liked the videos. I would like to say some words about the previous comments. I fully agree with the students that the information in these videos is explained in an extremely clear and easy way. As well as Anastasia Tsareva, I found out some new information about Modals that can help me to improve my knowledge. No doubt these videos are very useful and helpful! First of all I’d like to say some words about previous comments. I agree with Vika Korneeva that before I watched the videos I had had a little muddle about using of Modal Verbs. However, now everything is clear for me. I like the second video best of all, because I couldn’t understand the differences between using of ‘must’ and ‘have to ’. And as Anastasia Tsareva has already mentioned ‘must’ expresses my own desire and ‘have to’ expresses what somebody wants for me to do. In general all these videos permited me to repeat the material and clarify the incomprehensible points once more. I’ll start by saying that I enjoyed these videos! I like this man and his material is always interesting and useful for me. In my opinion he always gives a good explanation with examples. And my knowledge became more clear. Thanks a lot! Thank you for the videos! The grammar material in them is explained in a very simple way. I think that I know more about Modals now. From the previous comments I understood that the vast majority of the students liked the three videos. I absolutely agree with the students that the information which is given in these videos is very useful. By the way it improves our pronunciation when we listen to the native English-speaking people. So I always look and listen to such videos willingly! First of all, I may say that I like all these videos. To my mind, man explains the material very clear and organized and you understand everything without any difficulties. These video examples help me to recollect the material I have learnt before. I think that such videos are perfect addition to what we study at our lessons! First of all I’d like to say that I absolutely agree with previous comments that man’s explanations very clear and well organized. I enjoyed watching all these videos. I think it helps me better understand the rules of using modal verbs. And as well as Julia Petrenko I think that listen to native speakers can improves our pronunciation. Thanks a lot for posting these videos! As most of the previous students said the information is quite helpful and useful and I absolutely agree with them. I was glad to see and hear that cool man with his really perfect pronunciation. This videos helped me to refresh my mind associated with modal verbs. I understood the main differences between ‘can’ and “could” while watching the first video. I understood which requests are more stronger and which are less. The second video is interesting with good examples for using ‘must’ and ‘have to’ but it wasn`t new for me. As about the last video, I didn`t know that “might” is used for formal requests before. First of all, I would like to say, that I agree with comments of students, who considered these videos to be useful. There are good examples and the way of explanation is rather simple in the videos. They helped to refresh the material and to revel in them. Thank you for the videos! I agree with the previous comments that the information given in these videos are great! They’re very useful, because there have a clear explanation and good examples on the use of each modal verbs . I like the men and his manner of speech and to my mind if you listen to native speakers will improve your pronunciation. The videos help me to refresh all we’ve studied about modals and to understand the main differences between modal verbs, thank you! I fully agree with the students, who said that these videos about modals are very useful! Alex is a wonderful teacher and his explanations are very clear!!! I enjoyed learning from him) Also, his pronunciation is perfect! It’s important to watch such videos to recollect all the material you have learnt before. Well, first of all I would like to say that I really enjoyed all the videos mostly because of the teacher’s perfect diction and his manner of explanation.So,I absolutely agree with my groupmate, Julia Petrenko, that it improves our pronunciation when we listen to the native English-speaking people. To tell the truth, the theme was important to me as I could not use modals in different situations.As most of the previous students said the information is quite helpful and useful and I fully agree with them. The first video was very good.It was nice to know, in what cases we use modals can/could/be able to. In the second video I also met the new information.I didn’t know that “must” expresses my own desire. And the third video gives me some important information about may/might. Undoubtedly, these videos have helped me better understand the topic. Thank you very much for these videos! First of all I may say that I am completely agree with the comments of previous students that these videos are very useful. I had some difficulties in using the modals, but now I refreshed my knowledge and I know more. I guess I will have less mistakes. Guys, you`re absolutely right – learning modals is not as easy as many people may think. While making exercises we must pay attention to the context the modal is used in. Otherwise, we may make a mistake. As for the videos, I found them educative and entertaining in equal parts. They are not so long to be boring and at the same time they are long enough to make all the rules understandable for each of the learners. I absolutely agree with all the previous comments! In my opinion, the information, that you offer us, is really useful and interesting. I began to understand the material better and better. Wathing this videos , My attention was immediately attracted by pronunciation of the man . The explanation is quite accessible because of the example from the modern life. I agree with Yulia Markova in her statement that the material which You offer us is giving more clearness in what we need . Well, in general, I agree with previous comments! I’m sure, this information will help me in future! I like the first video, I like to listen this man with beard, and he can explain material very clear! I’m in love with his pronunciation and his explanation! I knew some information about modal verbs but and some was new for me! The second video was more difficult for me because I don’t see a big difference between “must” and “have to” and I hope it won’t a big mistake! The third video I like too, I can understand everything he said, but as always I need practice to use “may” and “might” in correct situations! So, thank you for these useful and helpful videos! Information about modal verbs are very useful and it is help us in the future, that is why I agree with previous comment. In the first video man with a beard tell us about difference between can,could and be able to. I know this article, but sometimes I confused in this, that why this man help me. In the second video man tell us information about must and have to.It is help me understand difference between this verbs. In the third video I teach new information about difference between verbs may and might. I hope this article help me. And I will not make a mistake. I like all this videos, because this is useful for all students.Thank you. Making a remark about previous comments, I want to agree that these videos aren’t boring at all! I have felt any kind of tiredness while watching them. Moreover, they are very informative and contain some solid information about modals. We should definitely pay more attention to who modals are used in context. Fortunately, nowadays everybody has the access to the Internet, so it’s quite easy to find out more on any kind of grammar material. What I would do to improve my knowledge on modals apart from watching vids and doing exercise is go to “Google” and find more sample sentences, to make sure my mind understands the topic clearly. Summing up what you have written, Vlad, I would say that practice is the most important thing in learning languages. I ‘d be happy if my students started to use the web in search of this kind of info) Unfortunately, I still have to “kick” most of you so that you started using the web for the purpose. I’d like to say some words about the previous comments. I agree with Katya Yerimizina that learning modals isn’t so easy. To tell the truth I had some problems with modals and often did mistakes. But now after watching these videos I hope I’ll never make such mistakes. I found out some new information about Modals that can help me to improve my knowledge. By the way, I agree with Vlad that these videos aren’t boring. In my opinion, this man is a little bit funny and he explains information in easy way. For a start, I’d like to thank you for such useful information. I agree with the previous comments. I like this teacher with a beard, and I don’t stop to admire his pronunciatoin! So, as for the first video, I understand everything, because this theme is clear for me. But, anyway, it helps me to refresh my knowleges. The second video was more interesting for me. I haven’t known that there is a big differenсe between ‘must’ and ‘have to’ before that. And now I try to don’t make mistakes in this situation. What about the third video, it was totally clear for me. And useing ‘may’ or ‘might’ wasn’t problem for me. In the conclusion, I’d like to tell that in general I liked all videos. But I rather prefer examples in different situations or dialogues, it’s more interesting and clear for me. Thanks for this useful links! This theme was important to me.The third video gives me some important information about «may » and «might». These videos have helped me better understand the topic. Most of the previous students said the information is quite helpful and useful and I fully agree with them. Thanks for this useful links! I have watched all the videos, witch were really interesting and useful for me, so I must say thank you! I agree with the previous comments, especially with Alyona Pereverza, who said that the second video was more interesting for her. She has not known that there is a big difference between ‘must’ and ‘have to’ before that. And now she tries not to make mistakes in this situation.So do I. Also I am impressed by the men’s prounansiation. It is so British! Thank you for these useful videos. In general all these videos are good and useful for me. This English man with a beard tells the rules and after each his rule he shows the examples which suits for the situations from the real life. I also like this men. He has a great beard and a lot of charisma. I also delight with his pronunciation. He pronounce every word correctly and distinct when he run his mouth. But the most important experience I got from these videos is information about modals “must” and “have to”. I learned how to distinguish this small contrast between these two modals. Thank you for all these videos. All three videos are clear to me.Thanks this videos I am refreshed my knowledge, and now I may say that I completely understand main differences between these modals. Also I pay attention to his great pronunciation and explanation. Every word is clear and understandable, and examples which helped to understand the theme much better are very useful. And this bearded teacher is funny and serious at the same time.Its very well that he is not only a serious, because it makes the videos are not boring and explains all the information in easy way. Modals is one of the most difficult themes for me to study. I can`t always understand the difference in the meaning of the modals. The videos were amazing! They really helped me! By the way, I admire the man who explains the material. He reminds me of Santa Claus and makes education funnier. Thank you for this useful videos! Before watching this cognitive videos I didn’t understand all details of using the modal verbs! I like the pronunciation of this man with beard, and his explanations make me feel myself more assured. His explanations are not isn’t complicated. This theme is important to me because often I don’t see any difference in using modals in different cases. I agree with those who believe that all the videos are good and useful.Listening to these videos you not only learn the modals, but also you get a great deal of kick out of the speaker’s style and manner of speach! I think that the first video is very interesting.It was nice to know, in what cases we use modals can/could/be able to. I think that the first video is very interesting.It helps me to understand this information.It was nice to know, in what cases we use modals can/could/be able to. And the third video gives me some important information about may/might.This video very useful! Modal verbs – it’s easy and also quite confusing subject for study. But if there is a desire to understand, and then there will be opportunities. These opportunities are provided by this blog in a very useful, clear and colorful form. I would like to thank Alexandra Georgiadi for her invaluable help in our learning English.